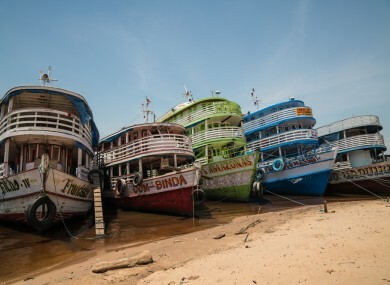 Five boats moored on the banks of the Amazon river in Brazil. EVERY WEEKDAY EVENING, TheJournal.ie brings you the five stories you need to know as you head home for the day. 1. #MATERNITY CARE: The Sisters of Charity announced that they will end their involvement with National Maternity Hospital and the St Vincent’s Hospital Group. 2. #TUSLA: A report found serious issues with inter-agency cooperation when dealing with vulnerable children taken from their parents. 3. #BUS CONNECTS: New bus routes, payment methods and bus designs were announced today by the NTA as part of a plan to reduce congestion in Dublin city. 4. #JOBSTOWN: A garda witness said he was called a “woman beater, a uniformed scumbag and a coward” after he helped a woman who fell over during the Jobstown water charges protest. 5. #YOUTH DETENTION: The Oberstown campus is making “real progress” its chairperson said today after a “challenging year” of strikes, fires and violence. The comments have been closed as a case is ongoing.